Precision Data Technology provides two prepackaged cable kits for quick and easy assembly of its Neutron Detector Pulse Counting Modules--the CKA and the CKB. If neither of these kits suits your needs, please contact us. NOTE: Unless otherwise stated, the standard length of each cable is one meter. One(1) Cable connection to "+Vcc" which terminates to a BNC connector on the opposite end. One(1) Cable connection to "TTL OUT" which terminates to a BNC connector on the opposite end. One(1) Cable connection to "HV IN" which terminates to SHV connectors on both ends. One(1) "+Vcc" Cable for daisy-chaining power between PDT series modules. 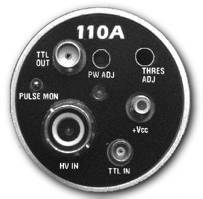 One(1) Cable for connecting between "TTL OUT" and "TTL IN" of two separate PDT100A, PDT110A or PDT120A modules. This cable provides digital pulse summing capability using multiple PDT110A instruments. One(1) Cable connects to the "HV IN" SHV connector. This cable terminates to SHV female connectors on each end of the cable. One(1) SMB T-Connector for "+Vcc" interconnections. One(1) SMB T-Connector for "HV IN" interconnections. If neither of the above cable kits suits your application needs, you may contact us directly for your special order. Please use the appropriate PDT cable part numbers when you place your individual cable order.